Page 158 Books welcomes author Mesha Maren to Wake Forest to discuss her new book Sugar Run. In 1989, Jodi McCarty is seventeen years old when she’s sentenced to life in prison. She’s released eighteen years later and finds herself at a Greyhound bus stop, reeling from the shock of unexpected freedom. Not yet able to return to her lost home in the Appalachian mountains, she goes searching for someone she left behind, but on the way, she meets and falls in love with Miranda, a troubled young mother. Together, they try to make a fresh start, but is that even possible in a town that refuses to change? Set within the charged insularity of rural West Virginia, Sugar Run is a searing and gritty debut about making a run for another life. 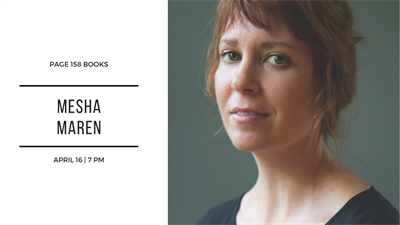 Mesha Maren is the author of the novel Sugar Run (Algonquin Books). Her short stories and essays have appeared in Tin House, Oxford American, Crazyhorse, Southern Cultures, Hobart, Forty Stories: New Writing from Harper Perennial, and elsewhere. She is the recipient of the 2015 Thomas Wolfe Fiction Prize, a 2014 Elizabeth George Foundation grant, an Appalachian Writing Fellowship from Lincoln Memorial University, and fellowships from the MacDowell Colony and the Ucross Foundation. She is the 2018-2019 Kenan Visiting Writer at the University of North Carolina at Chapel Hill and also serves as a National Endowment of the Arts Writing Fellow at the Beckley Federal Correctional Institution.